NEW YORK -- A carriage driver has been accused of altering a hoof brand to make a 22-year-old draft horse with a breathing ailment appear to be a healthier horse nearly half its age. Frank Luo branded the wrong hoof identification number on an aging horse named Ceasar, who was supposed to be resting on a Pennsylvania farm, so he could work under a license issued to a 12-year-old horse named Carsen, city health officials said in an administrative order last month. 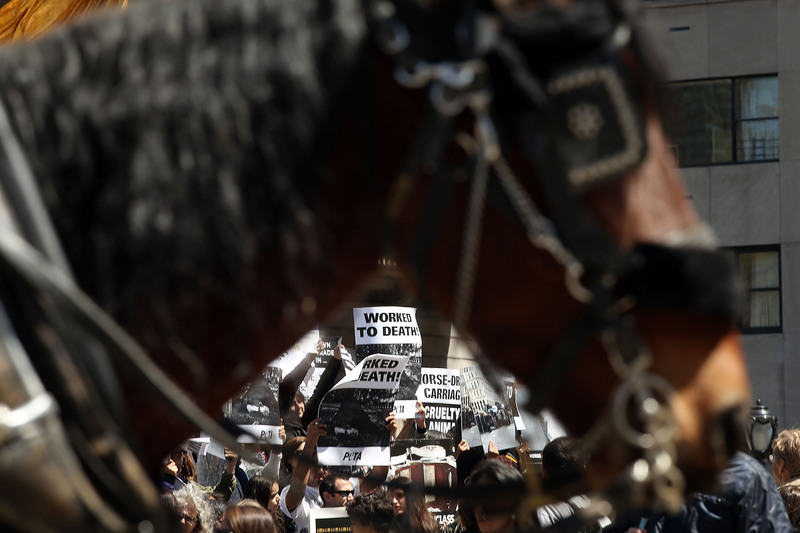 The details of the case, obtained by The Associated Press through a Freedom of Information request, come as Mayor Bill de Blasio and animal-rights activists are pushing to ban the city's carriage industry as inhumane to the horses. Drivers have responded by saying they care for the horses like their own children. In the written order, officials said a city vet noticed that the horse had Carsen's ID number on its hoof, but its "physical characteristics and medical condition was that of the older horse." Ceasar had a mild, chronic condition called "heaves," which is similar to asthma, city officials said. Luo told The Associated Press on Friday that the vet simply got it wrong. "I did not switch the horses. It's just very confusing because they look alike," he said. Initially, Luo submitted paperwork intended to prove that the horse really was Carsen, including a handwritten note from a Pennsylvania farmer who said Ceasar had been on his farm for months. The city asked for more proof, including a veterinarian's evaluation. Five days later, Luo's lawyer informed the department that he couldn't afford to have the horse sitting idle and had shipped him to Pennsylvania and sold him. "It's all settled now," Luo said. He said he would continue to operate his business using other horses. The sale effectively ended the investigation by the Department of Health and Mental Hygiene, which monitors the horses' health. But the Department of Consumer Affairs, which regulates the drivers, is still investigating. Luo's regulatory problems date to September, when he was cited for working at least two horses without active licenses. He also was accused of working Ceasar for nine days in July when the horse was supposedly in Pennsylvania. City regulations give the horses five weeks of pasture time each year. Also in September, the Department of Consumer Affairs cited Luo for false advertising, overcharging customers and operating a carriage for more hours than allowed. Luo's company, the Manhattan Carriage Co., agreed in January to pay a fine and restitution. In an unrelated incident, a horse Luo was driving in September bolted on 8th Avenue and hit a car. It suffered minor injuries. A 2007 audit by the city comptroller noted that health certificates kept for carriage horses sometimes contained physical descriptions that changed from year to year, suggesting they weren't the same animals. In 2008, a stable owner pleaded guilty to disorderly conduct to resolve allegations that he tried to bribe a city investigator. Carriage owners have denied any subterfuge and maintained that their animals are among the healthiest and most tightly regulated anywhere. The latest controversy comes as Mayor Bill de Blasio looks to ban horse-drawn carriages in the city and replace them with electric vintage-style vehicles dubbed "E-Carriages." "A horse in the middle of the streets of Midtown doesn't belong," de Blasio said on April 11. "I think a humane society doesn't do that to animals and we have an alternative where we'll have an opportunity for tourists to have a similar experience but without horses being a part of it." In a New York Times editorial earlier this month, actor Liam Neeson said he sees the proposal "as a class issue" that threatens the livelihoods of carriage drivers and stable hands.